HONG KONG - Amphibious assault ship USS Boxer (LHD 4), amphibious dock landing ship USS Comstock (LSD 45) and the embarked 13th Marine Expeditionary Unit (MEU) entered Victoria Harbor in Hong Kong Aug. 31 for a port visit. 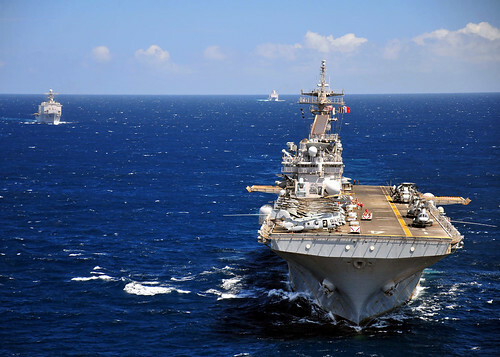 Boxer and Comstock are part of the Boxer Amphibious Ready Group (BOXARG) commanded by Commander, Amphibious Squadron One, Capt. Curtis Shaub. BOXARG’s more than 4,000 personnel include approximately 1,800 Sailors. The 2,200 embarked Marines from 13th MEU are led by Col. David Coffman. “We’re very happy to be here; Hong Kong is a favorite port of call for our Marines and Sailors, and this visit in particular is a well deserved break from the routine of overseas deployment,” said Lt. Col. Vincent Lumalcuri, executive officer, 13th MEU. While in port, servicemembers from BOXARG and 13th MEU will devote some of their off-duty time to participate in community service projects. Many are also planning to enjoy shopping, sampling the local cuisine, visiting local attractions and going on sightseeing tours sponsored by the ship’s Morale, Welfare and Recreation Department. Boxer, Comstock and 13th MEU are helping to strengthen relationships with our regional partners while operating in the 7th fleet area of responsibility. Boxer and Comstock are home-ported in San Diego, California.